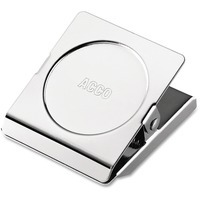 Super strong magnet allows this sleek square magnetic clip to hang in a number of convenient spots. Wide jaws accommodate multiple or larger documents. Powerful spring tightly grips and holds heavier documents. Available in 3 sizes 12 per pack.